Buen producto, es de metal, se ve un poco frágil, hay que probar si resiste abriendo una cerveza helada. O abridor é muito bonito e tem muitos detalhes. Só achei que seria um pouco maior. it looks very good but if you want use it to open bottles don't do it, it would be broken very quickly. A little light weight, but nicely finished. Pretty poor quality. Will use it only as a decoration. Крутая открывашка! Миниатюрная) Сокол выглядит довольно детализированно))Металличнская) Супер!Спасибо!Заказ к сожалению полностью не отслеживался! as other have mentioned is a on the small size.. a bit challenging to operated with an adult hand. 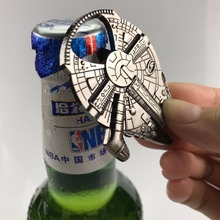 nice novelty bottle opener, but I wouldn't suggest it for daily use. Extremely quick shipping-arrived within 10 days to USA. Product feels smaller than pictured, but measurements are correct. Very nice gadget, however, I wish it would be two-sided. No es muy fuerte, por la foto parece que sea mucho más gordito, pero da el pego y la reproducción es buena. very fast shipping, came in less than a month. as described.